We thought we would ring in the new year with some more bread-and-butter Matchbox models. Two weeks ago we unveiled the newest police car the Lamborghini Gallardo Police, and today we stay in the public service sector and pull the cover off of two new emergency castings. And because I know the question will come up, the body is plastic, and the base diecast metal. I asked the team why this was the case, and was told it is because of the size of the model they had to produce the body in plastic to keep it within cost parameters. Yes, I would much prefer the Renault to have a metal body, but on the bright side at least it doesn’t have a front metal bonnet and fenders and a plastic torso, a la the Ice Cream Truck. I know the focus will be on the fact it is plastic, but I will say the model does look great. I like plastic… but I do wonder how Mattel can sustain such a large line of mostly-metal models (HW), with considerably more releases each and every year in many different specialty themes on top of a “basic” range of mostly-metal models numbering 250 models/year, and have a small division saying they can't use metal in their products because of “cost parameters”? Maybe I'm just dumb and all those HW cars are mostly plastic? Just sayin… But, I'm gonna like all of these 5 models/variations, and can't wait to find them in the stores! I actually like the firetruck! It resembles the trucks in England and although it unlicensed it is not over the top. The ambulance is the most realistic I've seen so far from MB. One thing about the generics is they are all starting to look alike and that ok for trucks but their car models I haven't seen as of yet. OK, if they are making the bodies in plastic, why don't they paint them? That way they would look way better and closer to metal-bodied castings. I like the addition of a Renault. The generic truck, meh, not for me. And its inclusion as one of the 60th anniversary models makes no sense, specially when it is just a colour variation, no added detail or anything. It is a symbol of how meaningless this series is. BTW, I wish all cars had the same error of the Renault, that logo is ugly. Thanks for the update John. But all I can say is that Mattel continues to disappoint. The cost cutting is getting beyond ridiculous to the point where it is ruining the product. Firstly, the Blaze Blitzer. Sure, this has a metal body, but is designed in such a way to minimise the amount of diecast. Big gaping holes in the side of the body and a piece of the window assembly making up the rear of the body. They could have at least detailed that large bit of grey plastic in the big square hole on the side. The overall design looks OK, but they could have at least try to make it look like a roll a door or showed some equipment. It just looks like the design team aren’t trying. I am guessing that it will also follow the trend of the shrinking Matchbox car. Has anyone else noticed that the new castings are getting smaller? No doubt another way to minimise the amount of diecast. Plus as a generic, this has no place being in the 60th Anniversary range. Mattel is expecting us to pay a premium for a generic vehicle with a bit more tampo and a picture box. Guess what Mattel? I won’t be buying it. If you had included the Dennis Sabre, then I would have. And then the Renault Master Ambulance. I initially suspected that this would have a plastic body, but I am still very disappointed to learn that this is in fact the case. It doesn’t matter what anyone says, the plastic body makes this look cheap and nasty. I do not want to collect plastic models and I simply won’t. If Mattel says that the plastic body is to keep it within cost parameters, my answer is raise the price. 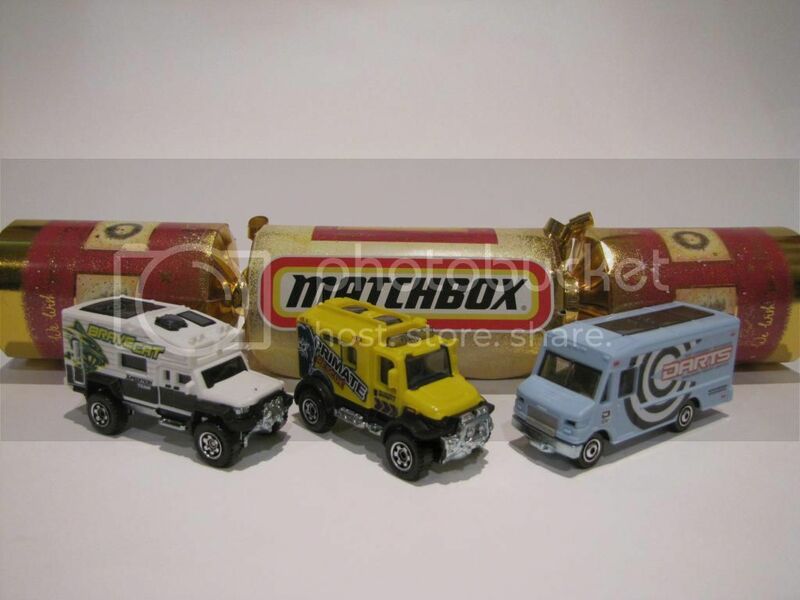 It is quite frankly bloody ridiculous that in 2013 we are being served up plastic rubbish while at the same time the average price for a Matchbox car (in Australia at least) is less than it was 20 years ago. The final insult is to put this plastic rubbish in the 60th Anniversary range. Sorry, but I thought the 60th Anniversary range was intended to celebrate the heritage of the brand. Well done Mattel, celebrating the heritage of a diecast brand with plastic. Yes, I am a lifelong Matchbox collector. I started collecting in the early eighties when I was about 8 years old. Mattel has done many things to disappoint me, but the plastic bodies takes the cake. I was collecting the 1-75/100/120/1000 range, but no more. I will only now buy what I like, which is not generics or plastic bodied rubbish. But it’s not just me who dislikes the plastic trend. I know several mothers who buy diecast cars for their children. In particular my sister in law was particularly disappointed with that fact that the Cars2 Movie toy Francesco Bernoulli is mostly plastic. So it’s not just the diehard collectors who are upset by this. So I would really love to know if Mattel have asked their customers about the acceptability of plastic bodies? I would think that most people won’t like it, which will ultimately lead to fewer sales. I’m certainly not buying as near as much as I used to. My yearly spend on new Matchbox has more than halved. It’s just a good thing that there is enough in the back catalogue to keep me happy. Honestly, I would rather see the Matchbox brand be phased out than it continue under the current ownership. Mattel doesn’t care about the brand or it’s customers. If they cared they would provide a catalogue/poster and an updated website. The fact that we have neither of these things, and savage cost cutting is really sad. So please Mattel, do us all a favour and either sell the Matchbox brand to someone who actually cares or kill it off. Please put us out of our collective misery. If these new models are any indication of what we can expect for 2013, it looks like my money will be spent on Greenlight and M2 products. It's a real shame Matchbox continues to cost-cutter it's way out of our hearts with more plastic bodies and bases, more generics, and a lower standard of quality. Some way to celebrate on a significant anniversary. Jonathan – sadly, I think the loudest voices, in an ironic twist, come from those with the most apathy towards the brand. These cheerleaders will buy anything with the Matchbox logo, no matter how cheap and gawdy the toys become. Apparently, they like the brand, not the wonders of transportation design and innovation. I miss the days when Lesney was dedicated to making the very best toy it could. Things like working features, quality castings and precision engineering were the things we fell in love with during the golden age of the brand (1960s). If today's product cannot better that from 40+ years ago, it's time to call it a day. Have Mattel ever been to Europe? That 'fire truck' looks nothing like a European fire engine… Looks more like a Dakar truck that they thought 'hey, let's put a fire livery on instead!' If you want a proper emergency vehicles model which is licensed and 100% accurate at the same price as a Matchbox, get the new Corgi toys. Fully diecast, heavy, and highly detailed. Oh and plastic models… Really? Ridiculous. And charging such a high price for plastic when Corgi (a smaller company) can charge similar price for a high quality product is a joke.